Apparently, there was a time when music and dance were indistinguishable, as in the case with dance and theater. For example, these artistic disciplines that we currently consider as distinguishable, were considered to be the same thing in the time of ancient Greece. Proof of this is seen in its well-known tragedies. Some people have used the term Artedrama in Spanish for this entwining of different forms of staging. The ultimate of Artedrama in the Basque Country are the Maskarada festivals of the province of Zuberoa, in the Northern Basque Country. Maskaradak are carnival related plays. Each year a group of young people, from a different town in Zuberoa, is in charge of organizing them. 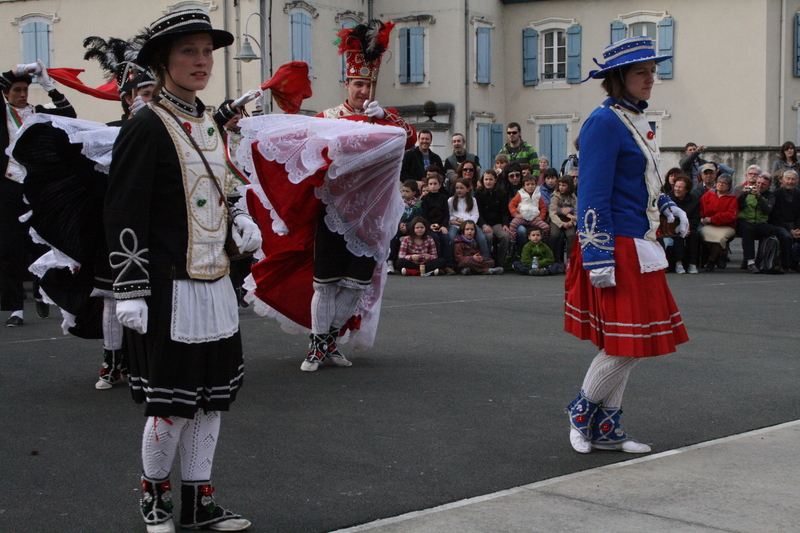 During the first four months of the year, they are staged Sunday through Sunday in different towns of the province. As mentioned, in this kind of popular theater, the elements of dance, music, song and theater itself are combined. A Struggle between Good and Bad People? Whoever experiences the Maskaradak for the first time will find two groups of characters: Gorriak (the red characters) and Beltzak (the black characters). Among the red characters are the Lord and the Lady, the Farmer and his wife, the Kükülleros (young dancers), the Marexal (blacksmiths) and perhaps the best-known characters, Aitzaindariak: Txerreroa, Kantiniersa, Gatuzain, Zamaltzain (with a wooden frame representing a horse) and Entseinaria. All of these are well dressed and are as elegant as they are dazzling. They are also fine dancers who perform complicated pre-classical steps. Among the black characters are Kauterak (coppersmiths), Buhameak (gypsies) and Kerestuak (castrators). All of them are dirty, and they are dark, ugly and violent. And somewhere in between the two extremes are the Xorrotxak (blade sharpeners). Knowing the characteristics of both groups, the Maskaradak have often been explained as a struggle between good and bad people. But is that really the case? In the opinion of some researchers (Roslyn Frank, Juan Antonio Urbeltz…) the Maskaradak are obviously divided between two groups: the bad and the worst! In the opinion of these researchers, the red characters of the Maskaradak symbolize human risk and evil, while the black characters symbolize even more dangerous ideas: the plague, an epidemic. The schedule of this festival of carnival is usually morning and afternoon. From the first hours of the morning the action begins with barricades, which represent the symbolic overtaking of the town being visited. At one time these barricades were real, physical obstacles that had to be overcome, but nowadays they have been replaced by tables loaded with food and drinks. This is how the host town welcomes the Maskaradak. Then the members of the Maskaradak show their appreciation for the welcoming through dances and singing verses. After eating, the celebration shifts to crafts. This way, the characters of the crafts represented in the Maskaradak, (Xorrotx, Kerestu, Kautere, Buhame…) offer a dance-ritual and dance related to their craft. Other dances are alternated with them. But during the afternoon there are two characters that take on the leading roles: Kabana, head of the coppersmiths, and Pitxu, his laziest and most mischievous disciple. It is an important characteristic that in the lectures and speeches of the characters, the most noted events that took place during the year, both in Zuberoa and throughout the world, are satirized with scathing humor. 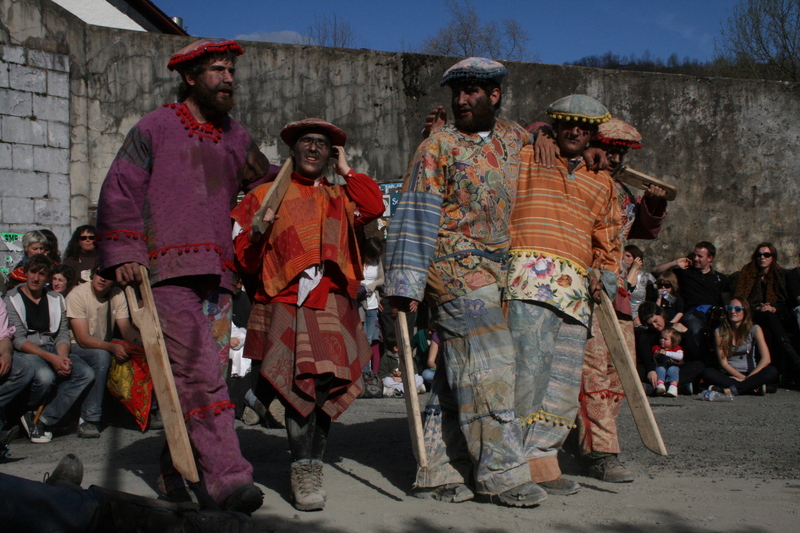 The Maskaradak of Zuberoa are impressive carnival festivals. The beauty of the costumes, the impeccable steps of the dancers, the sweet voices, the joking between the characters… turn this festival into an attraction of great interest and make Zuberoa a destination of Basque domestic tourism for 4 months. But beyond what we can appreciate with a first glance, the Maskaradak bring a certain meaning and are an essential event for the social cohesion of the residents of Zuberoa. 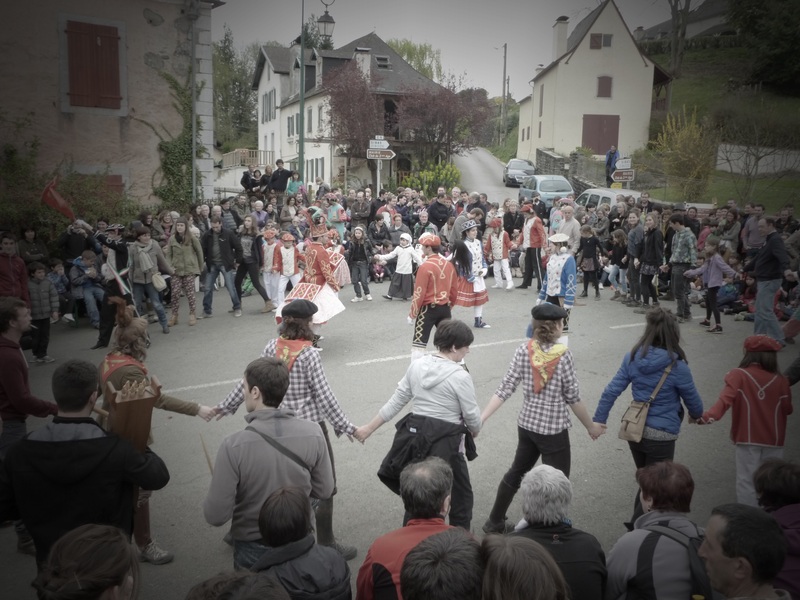 On the one hand it requires the involvement in the preparations of almost all the youth of a small town (the small villages usually have 300-400 inhabitants). On the other hand, it offers these young people the opportunity to visit the villages throughout Zuberoa, building relationships with the children, young people, adults and elderly people of the towns, both during the meals that are celebrated in homes as well as at the party following the Maskaradak. The evening dance (Branlea), where the performing visitors of the Maskaradak join hands with the spectators, is a beautiful metaphor of this union that is generated. There is no Maskarada without the Basque language. 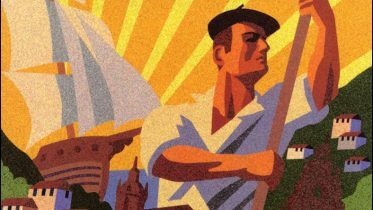 However, it is not always easy to find young Basque speakers who represent the characters in charge of lecturing and speeches, since Zuberoa is a province that has suffered the loss of Euskera. Can this somehow put the future of this popular theater at risk? The future really doesn’t look so dark. Due to the small revolution that the preparations of the Maskaradak stir up and thanks to the motivation that they generate, many young people have been inspired to start learning the language, for example at night schools. This is yet another asset of the Maskaradak of Zuberoa. Be the first to comment on "Maskaradak of Zuberoa. Festival and Community"